At our farm in the West Virginia mountains, life's simple pleasures still abound. 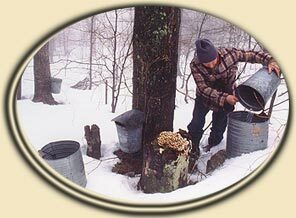 We invite you to share in the enjoyment of nature's own taste treat made in our maplehouse. Listed and pictured below are all of the products available from Richter's Maplehouse. Take a look at them. 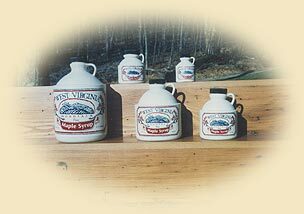 Maple syrup in jugs, maple syrup in fancy bottles, maple syrup and pancake mix stack-packs, even maple candy. Or call us and place your order by phone. Either way, we will be pleased to hear from you and glad to take care of your gift and personal needs. Makes a welcome holiday or thank-you gift. 1 Gallon Jug $ 58.00 13 lbs. 1 1/2 Gal Jug $ 32.00 7 lbs. 1 Quart Jug $ 18.00 4 lbs. 1 Pint Jug $ 10.00 1.5 lbs. 1 1/2 Pint Jug $ 6.00 1 lb. 1 3.4oz Jug $ 3.75 1/4 lb. Get together with family & friends and save! Corporate gifts and wholesale inquiries welcome. 4 Gallon Jugs $ 224.00 50 lbs. 3 1/2 Gal Jugs $ 90.00 40 lbs. 5 Quart Jugs $ 86.00 40 lbs. 10 Quart Jugs $ 170.00 20 lbs. 12 Pint Jugs $ 110.00 20 lbs. 12 1/2 Pint Jugs $ 67.00 10 lbs. 12 3.4oz Jugs $ 40.00 4 lbs.